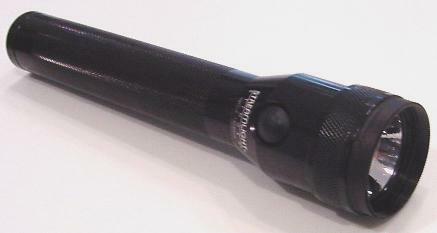 We have taken a high quality, American-made, police flashlight and added a 37mm filter ring to the front. This enables you to use all of our standard 37mm filters or and other 37mm camera filter. Using our Infrared filters, you can quickly convert this light into a IR flashlight. Available frequencies are 715nm, 780nm, 830nm, 850nm and 1000nm. This light has an adjustable focus beam making it great for throwing and infrared beam in a narrow or wide pattern. Depending on the IR frequency and your Night Vision Device (NVD), this light can easily reach out 100 feet. Please read our IR Flashlight FAQ for more information. Light shown with an optional 37mm filter. The XNiteFlashSTG can be charged by sliding the light into the charging mount. You do not need to unscrew anything. You can free the light instantly by pulling it out of the spring-loaded charging mount. Light in charging mount, 110 VAC power supply, 12 VDC car power supply, extra charging mount.